Again, a remarkable week, with 47 responses. Yow! We’re hiring new interns every week to keep up with demand. Again there are so many good ones that it’s hard to pick winners. But here goes. Free fake smashed Zunes are in the mail. 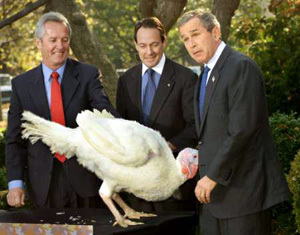 One turkey and one lame duck. … and a white bird sitting on a table. A bird in the hand is worth two… no, wait. A bird in the pants is worth one in the Bush. He already blew the election, the economy and the nation’s credibility, it’s only fitting he get something in return.